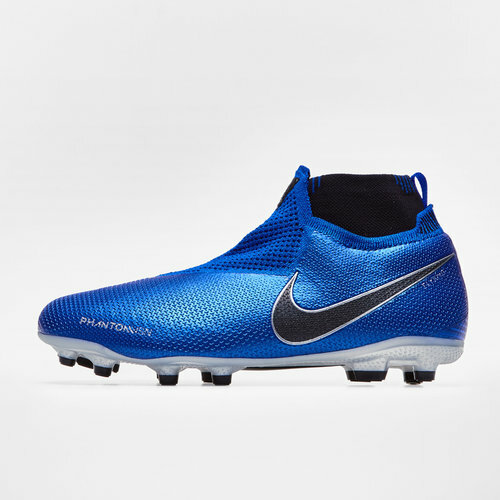 Designed to give you an unrivalled fit Nike brings to us the Phantom Vision Dynamic Fit Kids MG/FG Football Boot in Racer Blue, Black and Metallic Silver. These football boots from leading sports brand Nike have an excellent boot-to-ball connection. Built for players who need precision and control on the pitch. The Quadfit mesh inner bootie micro-adjusts to any foot shape whilst feeling soft and game-ready with a secure fit. The Dynamic Fit collar wraps your ankle with soft, stretchy knit to let your foot move freely. The Ghost Lace system conceals the laces for optimal boot-to-ball connection. These come with a super-light, full-length plate which feels responsive and has multi-directional studs for quick cuts and bursts of speed. These boots come as part of the Nike Always Forward pack. The pack comes with an outstanding colour scheme. The boots are predominantly royal blue with black or silver branding. However, the Mercurials are a volt colourway whilst the Phantom Vision boots are black with royal blue and silver branding. This pack are already favourites with the US national women's football team who have already debuted them.